This nautical vest features wide red and white stripes and has a turned bottom hem, rolled stockinette edgings, and an i-cord tie belt. Whether you’re headed to the boathouse or just a stroll around town, this vest is the beach accessory your spring outfit needs. This cozy vest with draped fronts is perfect for chilly days. You’ll love the clever one-piece construction and simple reversible stitch pattern. Wear this vest in several different ways for a versatile statement piece in your wardrobe. 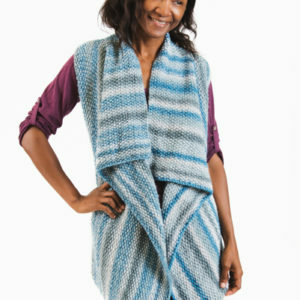 This unique design features a vest with a buttoned cowl neckline for extra coziness. 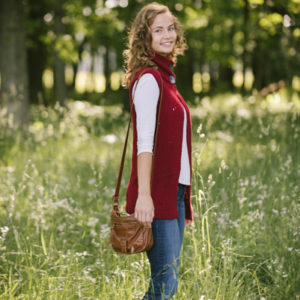 Casual glam at its finest, this vest is knit from the bottom up and will fly off your needles. Wear it with a simple tee and a pair of jeans. Knitting for men, especially for older ones, can be very frustrating: they don’t like anything that makes knitting so interesting: no cables, bold colors or rich textures, let alone lace! 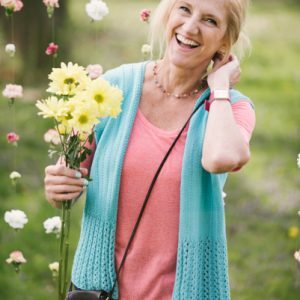 Knit something special for dad that incorporates colorwork, relaxing stockinette and no boring sleeves to knit. 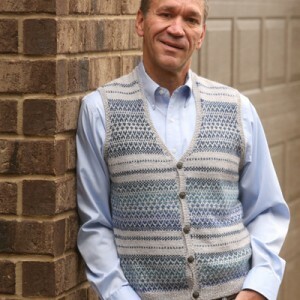 Vests are such versatile garments: they can be worn with short or long sleeves and underneath jackets. This layering vest takes this versatility one step further with the addition of a zipper. This Fair Isle piece will keep your core warm, and if you get too hot, unzip!